The amazing Toepperweins, greatest husband-and-wife shooting team in recorded history, are tuning up for their forty-third exhibition tour. 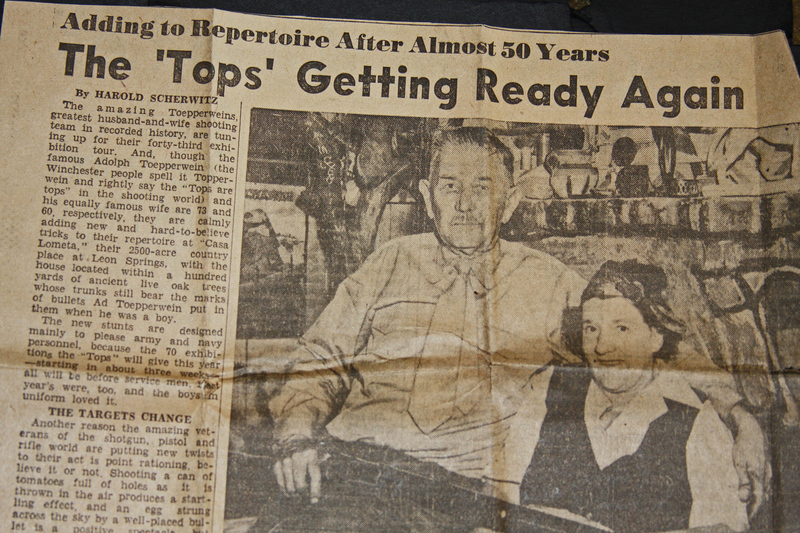 And, though the famous Adolph Toepperwein (the Winchester people spell it Topperwein and rightly say the “Tops are tops” in the shooting world) and his equally famous wife are 73 and 60, respectively, they are calmly adding new and hard-to-believe tricks to their repertoire at “Casa Lometa,” their 2500-acre country place at Leon Springs, with the house located within a hundred yards of ancient live oak trees whose trunks still bear the marks of bullets Ad Toepperwein put in them when he was a boy. The new stunts are designed mainly to please army and navy personnel, because the 70 exhibitions the “Tops” will give this year—starting in about three weeks—all will be before service men. Another reason the amazing veterans of the shotgun, pistol and rifle world are putting new twists to their act is point rationing, believe it or not. Shooting a can of tomatoes full of holes as it is thrown in the air produces a startling effect, and an egg strung across the sky by a well-placed bullet is a positive spectacle, but those stunts belong to the peaceful days of plenty. The wooden block and the old reliable clay target of the trapshooter, the “blue rock” are now the favorite props. No critical materials are represented in them and the Tops make the even more difficult job of smashing them in set of two to six at a time—a sight to see. Mrs. Toepperwein (or Topperwein, as the gun company prefers but as their neighbors refuse to spell it) is shooting better than she ever did, according to her husband, and her trick of smashing six trap targets thrown up at once, getting them one at a time as they come down at all crazy angles, is a stunt he defies anybody to equal. Realizing that thousands of youngsters have become devotees of shooting through watching the consummate skill of the Toepperweins and have sought to emulate them, the San Antonio pair has stressed safety in the handling and care of their firearms from the start. Finally, at the request of the Winchester factory, which also realizes the effect of their work on the youth of the land, they reluctantly abandoned the old dangerous (to other people who tried it) showmanship stunts of popping chalk, cigarettes, matches, etc., from each other’s mouth, ears and shirt buttonholes. The way they take care of their guns is a lesson to young shooters in itself. They never put down a loaded gun—anywhere. And, with Mrs. Toepperwein as a sort of property custodian, they keep their arms in perfect condition all the time. Many of Ad’s great records have been made with a gun he has had since the turn of the century, the first rapid-fire model made after the old single-loader. You have to know how to shoot it to make it fire rapidly, but to Ad it is almost a part of him—and he can shoot anything well. Mrs. Toepperwein—wearing the beaded ammunition pouch made by Indians and given to her by Buffalo Bill—shoots a lot with a Colt revolver with regular factory sights that she has had with her for 20 years. The Toepperweins’ history and their more famous feats are familiar to all in this section. That they are adding more to their exhibition program each year may surprise even their closest friends. Ad still “draws” Indians, cowboys, Uncle Sam and various cartoon characters with his rifle, shooting rapid fire at a “drawing board” of tin many yards away from him. This “art” comes more or less naturally, since he was a newspaper artist and engraver away back in 1897 and 1898 in the days of chalk-plate engraving. Some 300 shots from the .22 automatic are required for a picture. The wad-cutter bullet, an idea of his own that is now used in most target competition because it makes a clean hole and leaves no grounds for dispute over location of shots, serves Toepperwein well in his precision shooting tricks, especially when he shoots a pistol from all kinds of strange positions, lying prone or supine, shooting between his legs, and standing on his head—to mention a few. 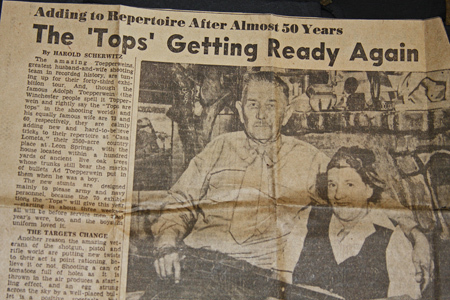 Relatives, like husky Max Toepperwein, nephew at Camp Stanley nearby, generally wander in to assist in the headstands, subbing for the soldiers who are invited up to steady the performer in the camp shows. The mirror the Toepperweins use in trick shooting – Ad has one stunt in which he employs the mirror to fire two pistols at objects in opposite directions simultaneously—is perhaps as greatly prized by the Tops as their guns. It’s just an ordinary mirror but the handle is taped for an easy grip and they’re accustomed to its size and weight, and they never let it get out of their sight or reach. You have to see them to believe it all when they get their minds on their work. Then it isn’t hard to imagine how they made their records or collected all the trophies that crowd their homes—in the city and at Leon Springs. You can see then how Toepperwein shot for 10 consecutive days, eight hours a day, at San Antonio’s old International fair and broke all but nine of 72,500 wood blocks of 2 ¼ inches tossed into the air by an assistant, or how Mrs. Toepperwein has had runs of 100 straight targets in traps more than 200 times, how she scored 497-out-of-500 from 25 yards in 50 shots with a .38 revolver, and how she broke 1952 regular trap targets in 5 hours and 20 minutes of shooting at Montgomery, Alabama, with a long run of 367, a feat never approached by another woman. How did they ever get started on this remarkable career? Ad Toepperwein was born to shoot. His father, Ferdinand was one of the best-known gunsmiths in Texas. Three months after Ad was born in Boerne, his family move to what is now Leon Springs, then located on a trial that is now the Fredericksburg road, and his father established a shop to which buffalo hunters, headed for Fort Concho, beat a path with weapons to be repaired or altered. Young Toepperwein knew guns and how to use them long before his father died when he was 13. And Mrs. Toepperwein—who she learned from one of the best shooters in the game, her husband---although she had never fired a gun before, she was shooting chalk out of his mouth a week after their marriage. There was perfect trust, which has endured through all the years to this day.